Here are Karen’s most popular books, with links to where you may purchase them. A comprehensive list of all Karen’s books and other publications can be found here. 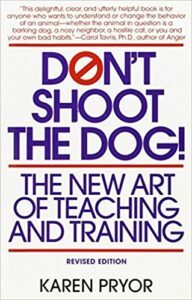 Widely loved for its clear and entertaining presentation of behavioral training methods, Don’t Shoot the Dog! is packed with Karen’s insights into animal and human behavior. It is the book that revolutionized teaching and training by simply and elegantly explaining the power, principles, and practical applications of positive reinforcement. 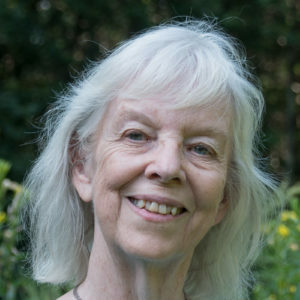 Karen Pryor has touched thousands of lives—both animal and human—through teaching people how to, as she puts it “create a climate of security in which it is safe to learn new things.” Now the author of Don’t Shoot the Dog! 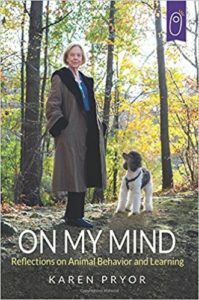 and Reaching the Animal Mind offers anyone interested in animal behavior an insider’s view of her world. You’ll “hear” the conversations Karen has with the animals she trains; you’ll celebrate their mutual break-throughs. Karen presents science with a personal touch and with humor—whether it’s laughing at her responses to her teakettle or investigating why sheep don’t herd themselves. This is a book about loving, understanding, and communicating with animals. Animals are a lot smarter and more aware than we used to think. Now you can share Karen’s experiences training and communicating with animals ranging from an elephant to a hermit crab. You’ll learn how you, too, can bring out the intelligence, personality, warmth, even humor, in dogs, cats, horses, and other pets, and have fun doing it, too. 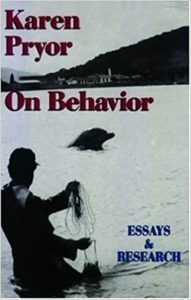 Karen Pryor’s classic collection of articles, essays, and research papers on training, learning, and behavior… from underwater studies of wild dolphin schools to a witty analysis of New York City weather. A great favorite of Karen’s personal fans, with lots of gems for the serious trainer or behaviorist too. 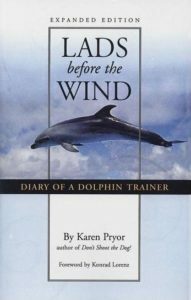 Lads Before the Wind tells the story of how Karen first learned about shaping and marker signals while training dolphins in Hawaii. Lads has become a classic over the years, especially among trainers. It includes chapters on her dolphin adventures after Sea Life Park days, from diving in the nets of tuna boats to using operant conditioning to really talk, and even joke, with a dolphin. 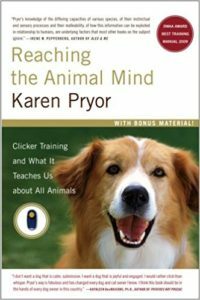 It ends with a chapter on clicker training—which Karen says is, after all, dolphin training for everyone! If you’re curious about clicker training and want to give it a try, Getting Started: Clicker Training for Dogs is the place to begin. 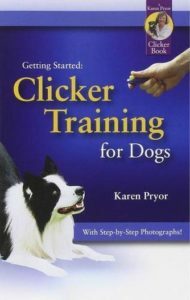 If you’ve tried clicker training, and know that it works, keep this clicker-training bible in your library to review the underlying principles and basic techniques.If you are instructor or professional trainer, it is the beginners’ reference on which you can rely. Winner of the 2001 Award of Excellence from the Cat Writers’ Association! Train a cat? Yes you can! Easy for you, fun for your cat. 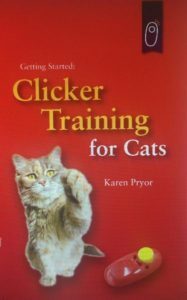 Clicker training can improve your cat’s health, activity, and attitude, and make your cat happier and more affectionate. Do cute tricks and games! 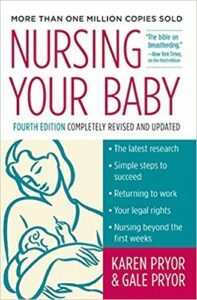 For more than 40 years, mothers have depended on the wisdom and warmth of Nursing Your Baby. Now authors Karen Pryor and her daughter Gale Pryor have revised and updated their classic guide for today’s generation of women.